When I plucked out Cuba as my next cultural cooking adventure I didn't expect it get under my skin like it did. Maybe it is the potent zing of white rum in the raw Cuban Rum Balls or maybe it is the liberal use of an ingredient as expensive as saffron that has left me wanting to cook more, eat more and learn more about the little crocodile shaped island in the Caribbean. Whatever it is I am intrigued. When embarking on a new cultural cooking adventure you must have a guide. Someone who can, just like a docent at a gallery, take your hand a guide you through the intricacies of their beloved cuisine. In my case I chose Joyce LaFray, a Floridian local who has spent years immersing herself in Cuban life both within her home state and on many trips to Cuba. 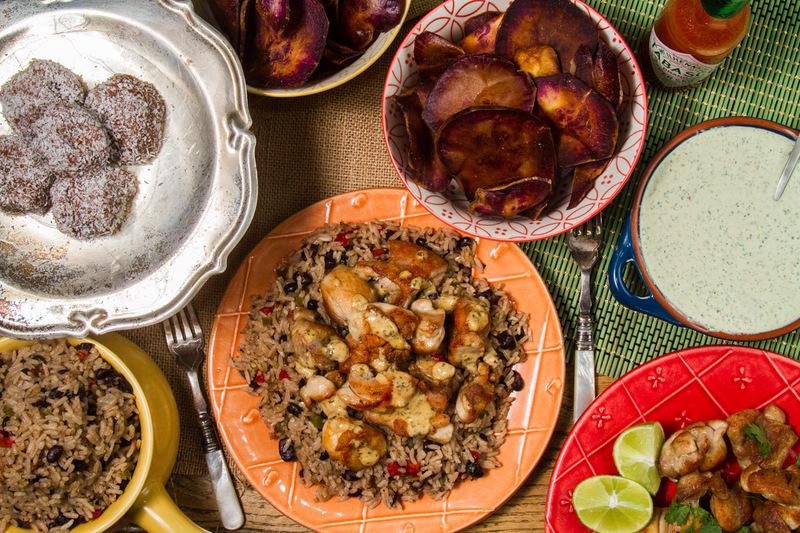 Her cookbook "Cuba Cocina" is a comprehensive guide to the food of Cuba. It covers recipes that would be considered traditional Cuban cooking as well as the more modern Nuevo cuisine that is emerging within the Cuban population in America. Written in 1994 this book doesn't have the visual appeal of a modern day cookbook filled with evocative travel photography but don't let that deter you. If it is strong recipe writing, exotic flavours and personal stories you want then this book will satisfy your curious little soul. To contrast Joyce's perspective which is one of an outsider looking in, learning and mastering a cuisine out of a love for the food in her local area I would highly recommend having a look at the blog Hungry Sofia. Like so many exiled Cuban families, author Ana Sofia Pelaez's family made their way to America in the 1960's during the Cuban revolution which left the nation struggling on rations and restricted by US sanctions. When asking her grandfather who had taught him to cook Cuban food his bittersweet response was "exile". Being from a wealthy family prior to exile to America he had relied on staff in his Havana home to do the chore of cooking. 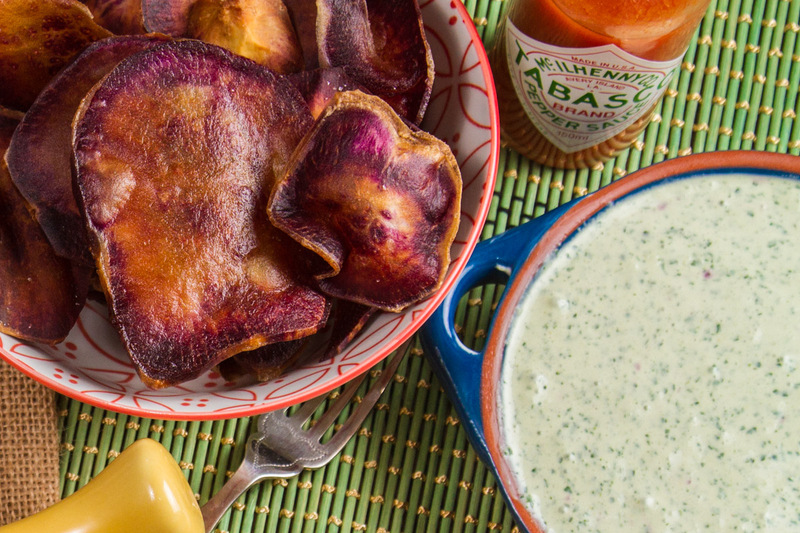 It is interesting that a new found love for cooking was bought about as a way to reconnect with a homeland he would never see again. Ana's book "The Cuban Table" paints a vivid and personal picture of her families homeland which although is now slowly opening up to the world is still heavily subdued by rations under communist rule. 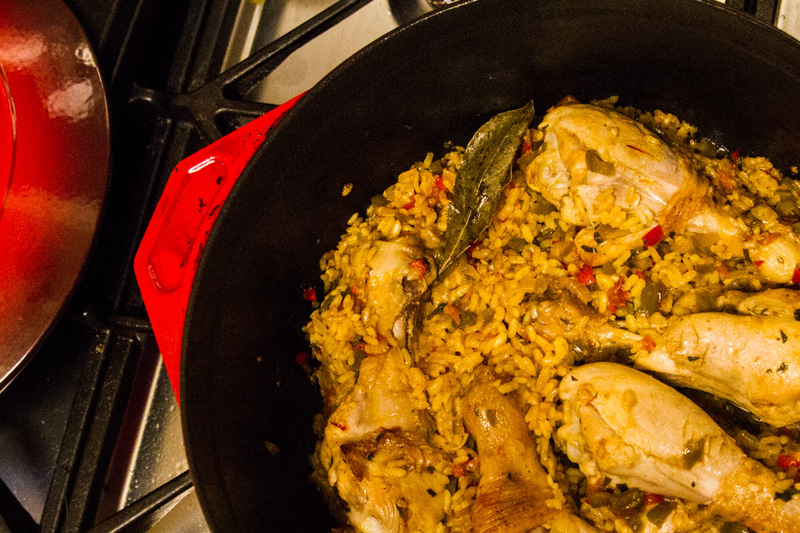 In cooking Cuban food I think you will be delighted in a cuisine that driven for more by flavour than technique. It is an ideal cuisine for those just starting out on their cooking journey as the recipes are as about as intimidating as a poodle in a pink bow tie and the results can be enjoyed by the whole family. I was actually quite taken aback by the amount of flavour packed into the dishes I cooked as Cuban food in the travelling community suffers from a terrible reputation. Jaded backpackers speak of endless beans and rice and bland root vegetables and whilst due to rationing that does seem to be the case in a large number of government run tourist restaurants on the island there are still hidden jems to be found. Ana and her co-author Ellen Silverman speak fondly of the family run private paradores which serve up food from the family kitchen often with ingredients grown on their own farms. I would highly recommend delving into Ellen's photography which gives you a real insight into the lives and kitchens in Cuba. We started our Cuban cooking week with a classic and a recipe I would recommend to anyone as a starting point for Cuban cooking Arroz Con Pollo. I chose it as it had an long ingredient list which doesn't always hold true but usually means...lots of flavour. In this case I was right. The rice is cooked to absorb all of the delicious ingredients chicken stock, saffron, white wine, oregano, cumin, garlic and the chickeny goodness infuses through the whole dish. My tip for this dish would be to get a good quality chicken stock or make your own as it does add a lot of depth and heartiness to this dish. 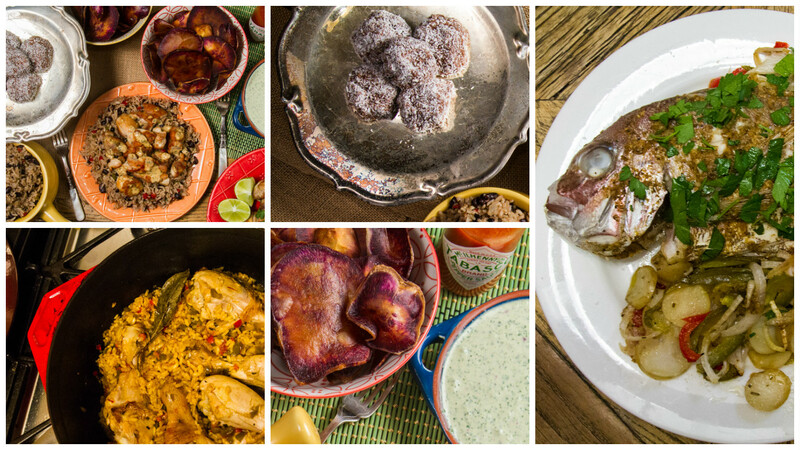 My recipe was from "Cuba Cocina" but if you want to jump in straight away and get cooking I would recommend trying this recipe from My Big Fat Cuban Family. Marta writes a great blog all about her Cuban heritage, life in America and a huge wealth of Cuban recipes so it is a great place to get started. A word of warning with Cuban cooking, the serving sizes are either "small army" or "whole battalion" and nothing in between. The next dish I made Havana Beef Hash, I halved the recipe and it still fed us for lunch and dinner for a number of days. This turned out to be our favourite dish of the week and I think it was because my expectations were low. It looked like it was going to be a variation of "savoury mince" nothing fancy but this dish turned out to be packed full of complexity. It was tart from the vinegar, wine, capers and olives and the onions and bell peppers bought a sweetness. We served ours with white rice which was the right decision as a more complex rice like the yellow or Cuban rice I had recipes for would have competed for flavour and this dish didn't need competition. This makes the best leftovers as it can be rehashed in so many different versions. It is great with rice, great with mash it's the gift that keeps on giving. We really cooked up a Cuban storm over the course of the week. 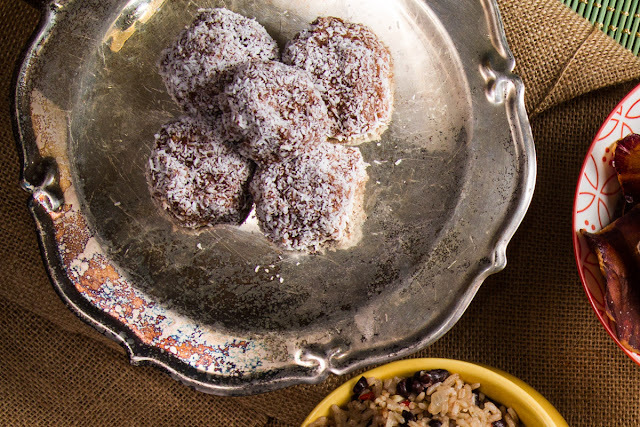 We also made Cuban rum balls which had a major white rum kick as the balls are raw and not cooked. 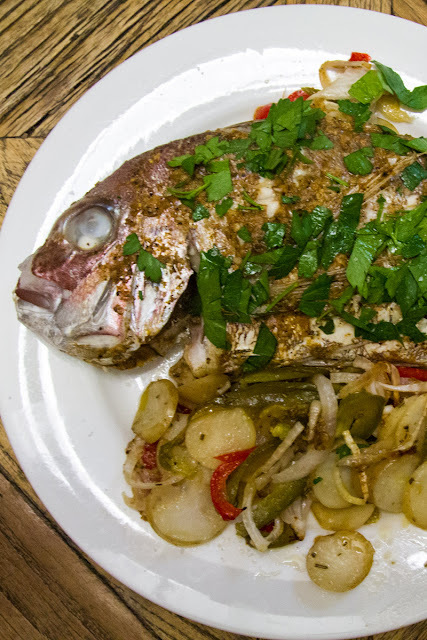 We baked whole snapper smothered in a rub of garlic, oregano, thyme, cumin, paprika, rosemary, salt and pepper as well as sour orange all served on a bed of roasted capsicums and potatoes. These flavours came up again and again in our Cuban cooking and were a really unique combination of herbs, spices and vegetables that ties this cuisine together. And finally we couldn't finish up the week without having the much famed beans and rice. 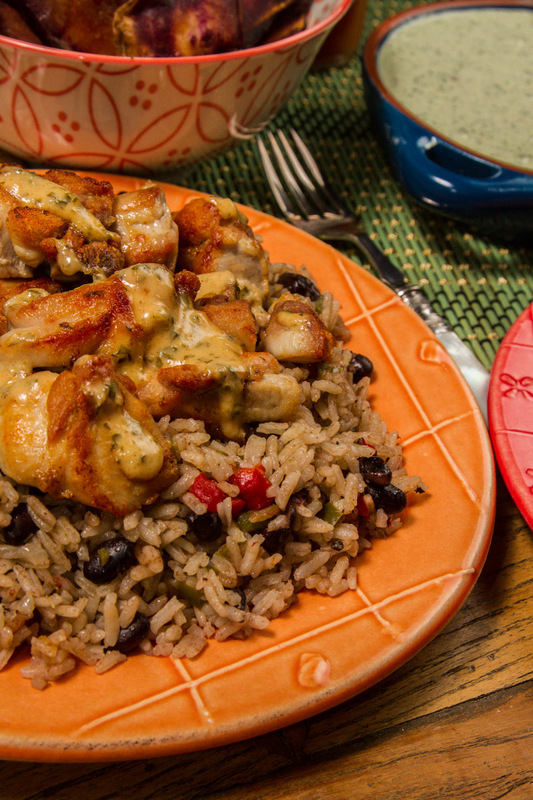 This recipe again has those signature ingredients mentioned above and married well with the lime-cilantro (coriander) chicken we served it with. If you want to go beyond the journey of cooking Cuban food to learn about a time when Cuba was the premier American resort holiday destination full of glam casinos and breezy Caribbean charm I would recommend reading "Havana Before Castro: When Cuba was a Tropical Playground" by Peter Moruzzi. Or if you want to go back further in time to Christopher Columbus and hundreds of years of Spanish rule I would suggest you take a look at "Cuba: A History" by Hugh Thomas. These books go a long way to shed light on how Cuba has become the fusion of cultures it is today and the roots of the cuisine that I so enjoyed this week.